WeatherTech TechFloor is the first modular floor tile system to offer TWO distinctly different materials molded into ONE tile. Our revolutionary TwoShot process (patent pending) produces an extremely rugged and low profile (slightly over ¼”) polypropylene plastic tile with attractive TractionSquares for wet-or-dry non-slip use. Soft touch underside offers incredible grip to virtually any floor. Each tile has 2 edges with loops, and 2 edges with tabs. They quickly attach to each other by laying the tab of one tile over the loop of the next, and snapping them down into place. Available in 6 tile sizes and 5 border options to allow fast wall-to-wall installation without the need to cut or trim. Based on our original TwoShot Solid tiles, our newest design adds 48 specially engineered FlowThru slots which allow fluids to drain through the tiles. 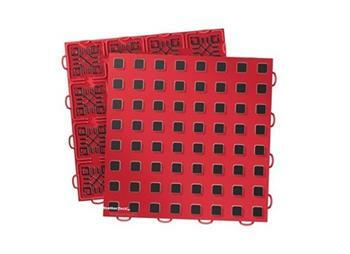 Add these tiles over a drain, or in any areas where you would like fluids to drain away. Available in 12” x 12” size tiles only, and are fully compatible with all of our other TechFloor tile styles, sizes and beveled edges. 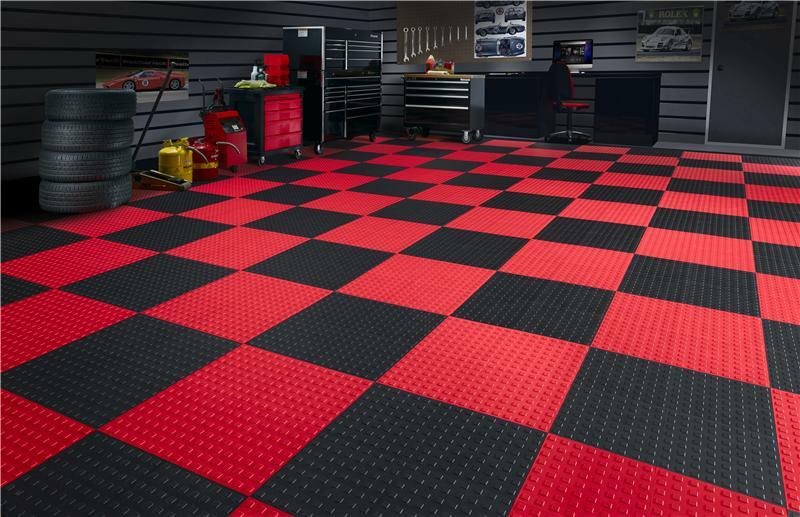 Mix and match your TechFloor to create custom designs, and fit your needs perfectly. Easily assembled and disassembled by hand using a snap together loop & tab system (patent pending). No professional installation or special tools are required. Tile are available in a variety of colors, beveled edges available only in black. Use a single color or create custom patterns by using multiple color and beveled edge options. Designed to withstand the daily wear and tear of virtually any floor: Garage, Basement, Shop, Laundry Room, Deck / Patio, Kid’s play area, Porch, Workout Room, Pool Area, Mud Room. TechFloor flooring is available in 29 different color combinations to match your style or design, and to add a custom look. The darker TractionSquares will easily hide dirt in high traffic areas. Colors available; Grey with Black, Grey with Grey, Tan with Brown, Tan with Tan, Red with Black, Red with Red, Yellow with Black, Yellow with Yellow, Orange with Black, Orange with Orange, White with Black, White with White, Terracotta with Brown, Terracotta with Terracotta, Black with Black.